PPF is an extremely flexible clear layer of urethane, computer cut to the shape of your vehicle. The film forms a clear, tough protective barrier that prevents damage from rocks, sand, and bugs. XPEL is the leading producer of paint protection films and their computerized templates allow us to cut kits that fit the shape of your vehicle. Protect your hood, fender, mirrors and bumper. This is where most road damage occurs. We have options to do a full wrap on your hood for the ultimate in protection or partial kits for just the leading edge of the hood. A brand new vehicle should be protected before road damage occurs. It only takes one rock thrown from the tire of a passing vehicle to impact your paint job hard enough to chip the paint. Once chipped that area is prone to rust. Vehicles with minor damage already present can still benefit from this product. 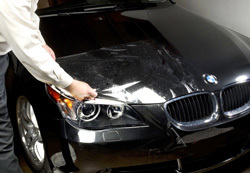 Prevent damage and maintain your vehicles look and resale value. Select PPF kits for your vehicle from our database. Just click the Start button above. Besides the pre-cut kits available we can also custom cut pieces for areas such as window pillars, leading edge of the roof, rocker panels, or any area you feel needs protection. A popular area is the top of the rear bumper where loading stuff in an out of your trunk can cause scratching. Our installers are factory trained and certified to install XPEL products. This ensures high quality installations.